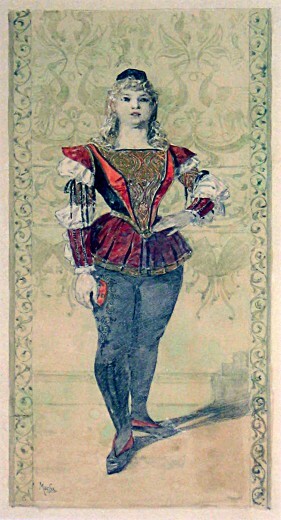 The publisher Lemercier gave Mucha a quasi permanent job making illustrations for Le Costume au Théâtre, a magazine devoted to the reproductions of stage sets and costumes from new productions in opera and theatre. His work with the magazine provided him with a fee and free tickets to plays. It was while he was working for Le Costume au Théâtre in 1890 that Mucha first drew Sarah Bernhardt as Cleopatra in the play by Victorien Sardou.